Sixty years ago, a pair of atomic bombs scorched Hiroshima and Nagasaki. Today, people who helped build them and people who felt their deadly power still grapple with the bombs' grim realities. Seventeen-year-old Sumiko Koide was carrying her baby sister in the alley next to her parents' house on August 6, 1945, when the world changed forever. At 8:15 a.m., the bomb nicknamed Little Boy exploded just less than 2,000 feet above the city. There was a silent flash, then chaos. The Koide family lived about 20 minutes by car from downtown Hiroshima. Destruction was everywhere. "My father had a greenhouse. All the glass was shattered. Much of it blew into the house," Koide says over the telephone from her home in Rawlings, West Virginia. Now 77, she lives as Sue Walker with her husband, Glenn Walker. At one point after the blast, she recounts, a roof tile broke loose and hit her on the head, but neither she nor her sister was seriously injured. The bombing and its immediate aftermath stamped Walker's memory with indelible images of horror. "I saw so many dead people," she says, "so many walking with the skin dropping off of their faces and hands, so many with their faces terribly bloated. " The Little Boy explosion was equal to about 18,000 tons of TNT. Nearly 70,000 men, women, and children flashed out of existence, and nearly 70,000 others were injured. Radiation killed many more over the next half-dozen years. The total death toll in Hiroshima was estimated at 140,000. 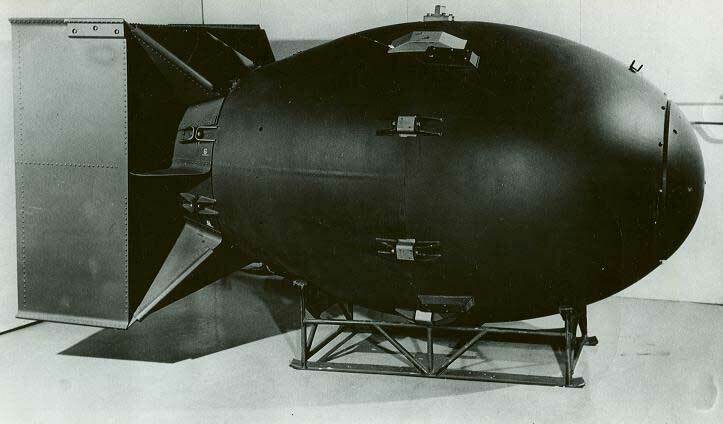 Three days after the bombing that Walker witnessed, another bomb, nicknamed Fat Man, was exploded over Nagasaki. Though it missed its target by more than a mile, the bomb managed to destroy half the city. Nearly 40,000 died instantly, and more than 25,000 were injured. By the end of the year, radiation poisoning had pushed the death toll up to 70,000. Many of Hiroshima's children were out of the city when the bomb struck, on trips sponsored by their schools. They were spared, but many lost their families. Walker met Glenn while she was working in an orphanage for children whose parents were killed in the bombing. He was one of a group of GIs who brought food and candy for the kids. Glenn and she began to date and eventually married, neither of which won unanimous approval from the Koide family. But hostility eventually waned. "After a while, they held no grudges," Glenn says. "At the beginning, one of her uncles would not talk to me. That went on for several years. His brother was killed by the bomb. His daughter was missing for a while, and when she was found, she was terribly burned and later died." Asked whether the bombings could be justified, whether they shortened the war or saved lives in the long run, Walker replies, "I don't know. I guess there would have been more people die in an invasion, but not all in one place. It is hard to say that it should have been bombed." After a moment's continued reflection, she adds, "We would not have given up, I think, if not for the bombing." She explains that each home had bamboo spears standing inside its front door in case of American invasion. Everyone, children included, had strict instructions from the government not to surrender if Americans came. "We were each to kill one and then ourselves." In fact, historians say, some of Japan's leaders had wanted to end the war in the spring of 1945, but military leaders trained to preserve pride and honor at all costs held out. US leaders believed that Japan's eventual surrender was inevitable, but that the number of lives lost would have been huge. Delanson Crist--son of Ray Crist, who worked on the Manhattan Project to develop the atom bomb--says that was a chief concern of the project's scientists. "One of the reasons for dropping the bomb on Japan was the saving of so many lives, Japanese and Americans," he says. " After Germany surrendered, the allies were ready to go after the Japanese in their homeland. They were expecting hundreds and hundreds of thousands of deaths. It's a kind of terrible math: hundreds of thousands of casualties, versus many more hundreds of thousands of casualties. The bomb was dropped and that stopped everything. The Japanese ended up in peace negotiations." In late July, nearly three months after the German surrender in Europe, Radio Tokyo announced that Japan would continue to fight. Within nine days, the Enola Gay bore Little Boy to the dawning of a new age and a new hell--and the end of the war. Not all the scientists who helped figure out how to crack the atom to its heart and release the power that ultimately flattened Hiroshima were comfortable with the practical application of their work. Some had suggested that, if Japanese officials were given a demonstration of the bomb, they might be persuaded to surrender. J. Robert Oppenheimer, who headed the Manhattan Project, did not believe a mere demonstration would do the job. He concluded, "We see no acceptable alternative to direct military use." Oppenheimer was hardly enthusiastic about using the bomb, however. 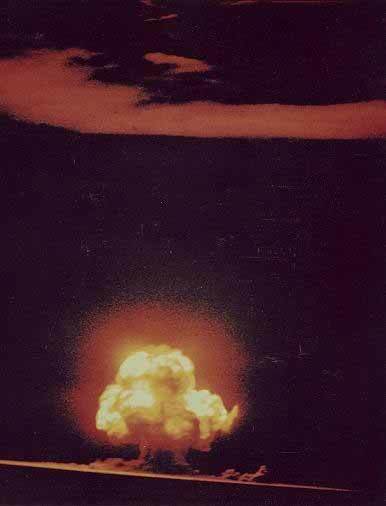 At the first-ever atomic bomb test, in the American desert in July 1945, he reflected grimly, "I have become Death; the destroyer of worlds." In the years after the war, his vocal concerns over the dangers of nuclear weapons would prompt critics to accuse him of having communist sympathies. He would lose his security clearance by 1952. Oppenheimer was just one of many of the A-bomb's creators who would have been happy to stuff the genie back into the bottle after the bombings of Hiroshima and Nagasaki. In 1950, Niels Bohr, another Manhattan Project scientist, would plead for the United Nations to help create a world free of atomic weapons. He dedicated the rest of his life to speaking out against nuclear research. Leo Szilard and Albert Einstein were both instrumental in the discovery of nuclear fission, and in the creation of the Manhattan Project and the atomic bomb, though Einstein was not part of the Manhattan Project. The two men had once written to President Franklin D. Roosevelt asking for research money to study fission. Einstein's letter, which Roosevelt received in August 1939, stated that new technology would make possible "extremely powerful bombs of a new type." He noted that Germany had stopped selling uranium from Czechoslovakian mines and" that some of the work American scientists had done on uranium was being replicated in Berlin. Later, Einstein would describe this letter as one of the great mistakes of his life--though the threat of Germany building the bomb first, he said, provided "some justification." Szilard was one of 70 scientists who wrote a letter to President Harry S. Truman late in the war to protest the use of the bomb. "We believe that the United States ought not to resort to the use of atomic bombs in the present phase of the war, at least not unless the terms which will be imposed upon Japan after the war are publicly announced and subsequently Japan is given an opportunity to surrender," the letter stated. "Atomic bombs are primarily a means for the ruthless annihilation of cities. Once they were introduced as an instrument of war it would be difficult to resist for long the temptation of putting them to such use." Like Bohr, Szilard spent the rest of his life working to curtail the development of nuclear arms. Still, says Ray Crist, he and the other developers of the bomb believed they had little choice. A 1916 graduate of Messiah Bible School (now Messiah College) near Harrisburg, Pennsylvania, Crist graduated from Dickinson College in nearby Carlisle in 1920. While at Dickinson, Crist went to Plattsburg, New York, to train to become a sergeant in Dickinson's equivalent of the Army Reserve Officer Training Corps. He had to teach other students how to use a bayonet, which he found repugnant, says his son Delanson. Crist earned his doctorate in chemistry from Columbia University and taught there until 1941, when he joined what was formally called the Manhattan District Project, after the Manhattan Engineer District of the US Army Corps of Engineers, based in New York City, where much of the early research was done. The original name had been Development of Substitute Materials, a title the military feared might reveal too much. Crist retired in 2004 from a research post at Messiah College. In his later years, he worked as a researcher in the field of bioremediation, a method of using biological materials such as algae to remove heavy-metal contaminants from water and soil. In 2001 he collaborated with Delanson on a paper on the topic. The paper was presented to a meeting of scientists in, of all places, Nagasaki. At 105, Crist still firmly believes the atomic bomb was a necessary evil. That was especially true, he said, after scientists found a way to make uranium-235 (the radioactive substance used in early bombs) pure enough to use in a bomb. "After that, there was really no [question of] morality. There was a real chance of the Germans getting it, and we knew they were working on it.... Everybody was terrified of the Germans finding this first. It was a matter of life and death." In the summer of 1945, Crist was in charge of part of the Manhattan Project, with 600 people working under his direction. By that time, the bombs and the decisions made regarding their use were out of the hands of scientists and in the grasp of politicians and the military. The project had lasted about four years and had cost nearly $2 billion, roughly equivalent to more than $20 billion in today's dollars. Crist decided to take a vacation to visit his parents in the little Pennsylvania farming community of Shepherdstown in early August 1945: It was not going to be much of a vacation. "My parents did not have a very good radio," he recalls, "so that afternoon I was visiting neighbors, listening to theirs. We heard that a bomb was dropped in Hiroshima. I realized what had happened. I thought, oh, there they go!" He was rushed back to Columbia. After the war, Crist was one of a group of scientists invited to travel to the Far East and witness a demonstration of an atomic bomb blast. He declined. "I didn't want to go," he says. "I didn't want to get a personal sense of what the bomb would do." Terry W. Burger has worked as a reporter and columnist for the The Patriot-News in Harrisburg, Pennsylvania, and has written for Civil War Times and other magazines. This article originally appeared in the August 2005 issue of America in WWII accompanied by an A-bomb timeline and a written exchange between President Harry S. Truman and Senator Richard B. Russell of Georgia. Order a copy of this issue now. 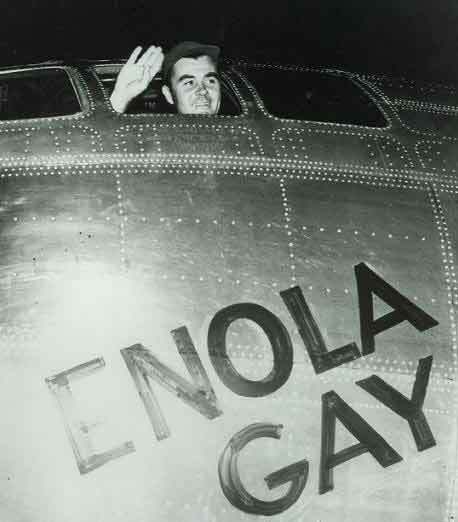 Top pair of photos: The first atomic bomb lights up the desert near Alamogordo, New Mexico, in a test on July 16, 1945, and Colonel Paul Tibbetts waves from the cockpit of the B-29 Enola Gay, which he would pilot over Hiroshima, Japan, to make history's first atomic-bomb drop. 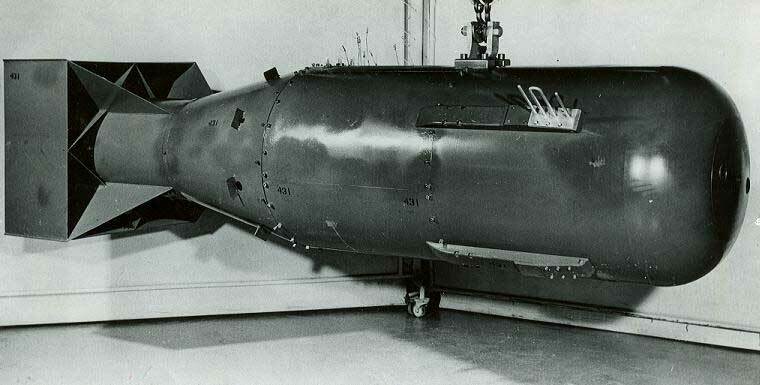 Middle two photos: The atomic bomb known as Fat Man, destined for Nagasaki, and the one known as Little Boy, destined for Hiroshima. 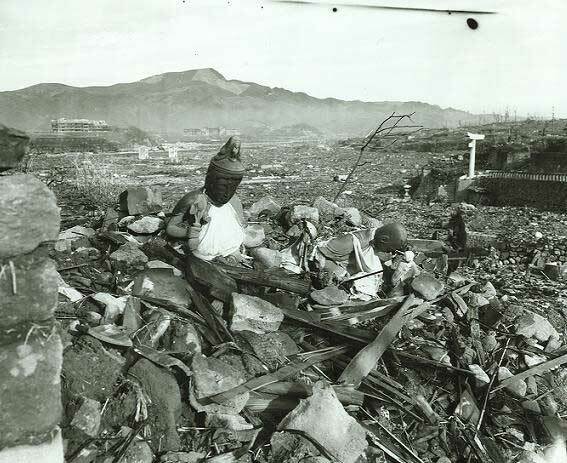 Bottom photo: A statue of Buddha lies among the ruins of Nagasaki.